A step up to 1400m at the spacious track that is Sandown saw the promising Piemonte salute in exciting fashion at just his second outing. 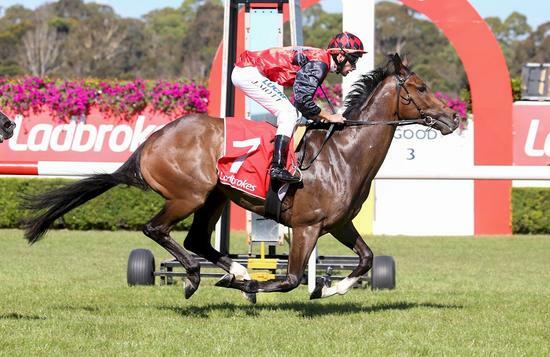 Having finished off nicely over a shorter trip at his Mornington debut, Piemonte looked a horse to follow but in a handy metropolitan maiden field was double figure odds - nice for connections! Whilst not having the most ideal run out wide, Piemonte did travel well for Jamie Mott who had him in a good position straightening, the three-year-old able to hit the lead before the 100m - quickly getting clear despite racing greenly. "He is a beautiful horse," Mott declared, "though still a bit new. " "It would've been nice to get some cover but the most important thing was that he was nice and relaxed. He covered ground but I liked the turn of foot he showed." "When I gave him a squeeze he picked up straight away. He ducked in a bit - he has got a bit to learn but he is a really nice horse." Robbie agreed - "he is a lovely horse who has always shown us plenty at home. He was good in his trials but a bit aggressive so we went for a high pressure track at debut." "Jamie gave him a beautiful ride - we drew a bit awkwardly so I thought winning would be a bonus but now that he has we will stick to progressive races and be patient with him." Joking that Piemonte was still on the stable website having not been fully syndicated, Robbie is pretty pleased to have Shiranee take the remaining shares of such a promising young horse! A son of the Melbourne Cup winner Fiorente, Piemonte caught the eye at the 2017 Inglis Melbourne Premier. He is the second foal and second winner (four times winner Exellas the first) for the placed Canny Lad mare Ellas who hails from the family of big race winners Street Cry, Territories and Shamardal.